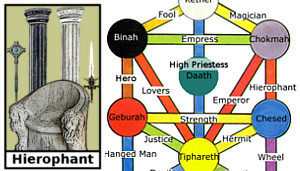 If you distill the meaning of the Hierophant tarot card down to its core, you get: your Word. I am going to capitalize “word” for a reason. Your Word is the unique message that you bring to this life and this reality and even the universe. Everyone has a Word, but not many people know what that is. Your Word is usually something that can be distilled down to as few “words” as possible. My Word for example is “I create.” That is the message I bring to this reality to share with all of you. I create my world, and I in turn pass on that Word to you in the form of teaching and knowledge. Now, your Word does not have to be retransmitted formally as I have done here with my work at Wisdomsdoor. But you do transmit your Word to the people around you: your family and friends. It is in this place that you can discover what your Word is and how that fits into the goals you came here to achieve. The “Altar of Word” is located between Chokmah and Chesed. It is created by the undifferentiated energy from Chokmah, which needs direction and focus, and the energy of Chesed, which demands obedience to the higher self, to make sense out of your journey. These energies combine here with your own unique flavor of self to create your Word! Your Word is powerful! It is tied to your core being and is a big part of your physical and spiritual journey. Your Word is sacred and it is special, much like biblical text is to religious scholars. It is important to be true to your Word. Because if you are not, you will most likely be unhappy and be very short on reality creating power. At this level of spiritual awareness, knowledge of your Word is important. You are preparing to cross into Kether and into the spiritual realms. You want to shout your Word out as you pass the threshold of Kether and gain the the blessing of the Archangel Metatron. In many ways this place is linked to other tarot card places you have been. Your Word is both a public and private creation. It is part of you and your core being, and yet it also is your mark that you leave wherever you go in the Cosmos, and of course physical reality. Your main spiritual identity is shaped by what your Word is. 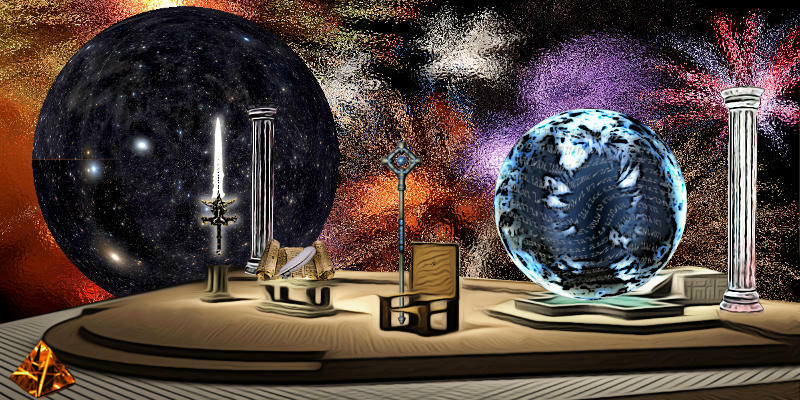 So, here, in this place, you may see some similar items from previous tarot locations. The “Book of Law” containing the spiritual law you must abide by, and the feather pen which allows you to change your beliefs when it is time for them to change. Your Staff, which symbolizes your spiritual power. Your Sword, which symbolizes that the way you deliver your Word can either heal or destroy. The “Pillars of Light and Dark” symbolize the dualistic nature of reality below the spiritual plane and something you must consider when transmitting your Word. The “Pyramid of Tomorrow,” where your vision of the future is stored. Finally the “Crystal Sphere” from the Crystal Palace is here. However, here, it is much more. It has changed because you have changed, and it is now a crystal ball that you can use to view where in your life your unique Word is needed. The main quest here is to examine everything you see here. Talk to the spirit guides and then finally, look into the large crystal ball and see what areas of your life require your attention (your Word). It is a sign that your Word is ready to be received in that place. When you do wield your Word, choose your words carefully but also remember to deliver it with love. The guides you may meet here can vary but will often be Angelic or Ascended Masters (Master Jesus, Ra, Gabriel, Sanalphon, Hawk-like guide). As it is important to keep your Word pure, these beings can help you to develop your Word so that it always reflects the best possible energy. If you do not yet know what your Word is, explore this place as much as you can and talk to whoever is here so they can help you find it. Keep in mind that your Word is not static, it can change over time as you change. So if you do discover at some point that your Word does not seem to fit anymore, come back again to find out what it has changed into. The one time gift here is the “Right Hand of God.” It is said that from God’s right hand flows his spiritual power to create change. This gift allows you to channel this power to make changes in your world, as long as those changes are in perfect harmony with the divine will. Visit the "Altar of the Word" when you need to affirm or adjust your Word or when preparing to spread your Word to the world around you. Ankh: use it to refresh your spirit and to extend your life. 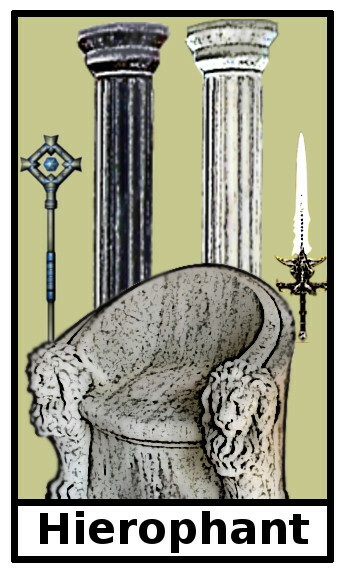 Scepter: mastery over the lower self. Commands your reality to come into harmony. Papal Tiara: you know your Word and are ready to deliver it to others. Behind the portal is a basin of spirit water that you can use to get an old fashion blessing with water. Just sprinkle some on your face.